Light up your life with these fun and versatile lights! - Save year after year, inexpensive to operate as they draw so little power, use them all year long with no worries. One remote can control several lights at the same time. 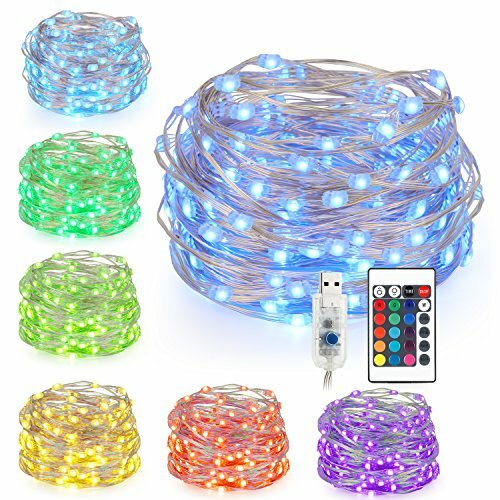 【16 colors to choose from】 amazing 5m/16.4ft 50 LED string lights comes with 16 vibrant colors, so you can choose the color light to go with you theme (red for Valentine's tree, blue for Halloween's costume). Perfect for DIY led light crafting, Festivals/wedding/Halloween party decoration. 【Remote Control with Timer】 24-key buttons; 16 colors options; Flash Mode (auto-switch among 16 colors rapidly); Strobe Mode ("white" color dim slowly); Fade mode (different colors fade in and out); Smooth mode (cycle through red, green and blue); Timer Mode (8 hours on and 16 hours off). 【USB port starry string lights】 USB connection instead of regular adaptor give it a lot more possibilities, run via USB adapter or a power bank instead of batteries, no wasting money replacing batteries. ON/OFF Switch: turn the lights on and off without the remote, you can also choose steady white, red, green or blue by pressing the button on the USB plug. 【Newest 4 Wires】 Each strand consists of 4 high-quality silver wires, which are sturdy, waterproof, insulated; it won't get overheated, keeps the lights at a low temperature so they are safe to touch after many hours of use, perfect for family with kids and pets.